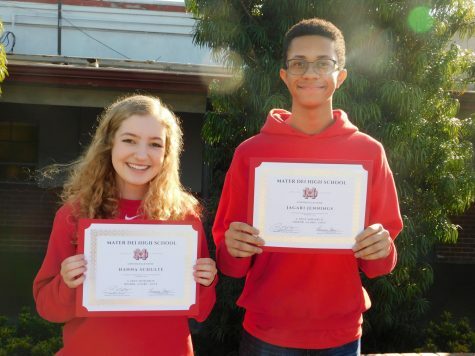 Each month, a boy and a girl from the senior class are nominated by teachers and faculty to be Monarchs of the Month. 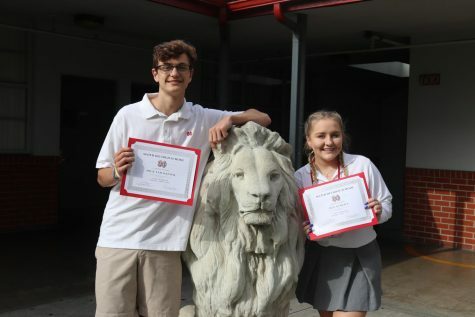 Those chosen uphold and exemplify what it means to be a Monarch and this award recognizes their accomplishments during their four years at Mater Dei. 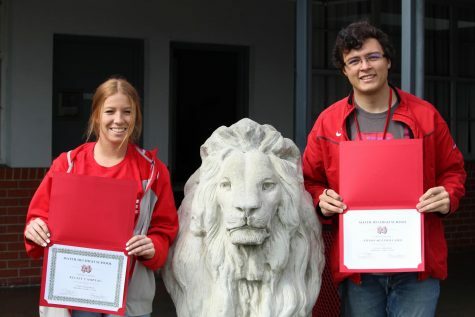 The students honored for January are Rodrigo Gonzalez and Taylor Morales. As one of the Head Commissioners of Campus Ministry and the team captain for the Academic Decathlon, Rodrigo Gonzalez is heavily involved in student life around campus. 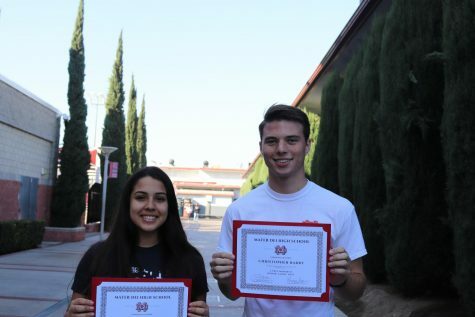 In addition to these two leadership positions, Gonzalez works as a staff reporter for The Scarlet Scroll, an experience that he hopes will help him achieve his goal of becoming a sports broadcaster. “I really think that getting involved helps me learn how to become a better and more productive person, but it also reflects on the things that I appreciate,” Gonzalez said. Through his leadership on the Campus Ministry Commission, Gonzalez focuses his time assisting with charity outreach activities and leading the rest of the commissioners. 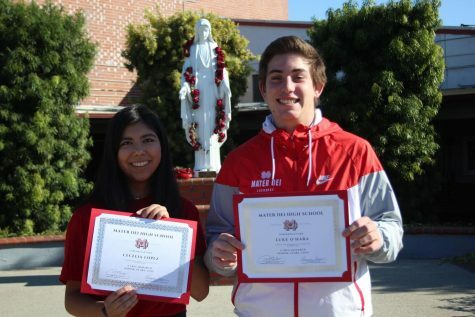 “I appreciate the religion and openness of Mater Dei so that’s why I participate in Campus Ministry – to make sure it continues,” he said. As a leader in different school activities, Gonzalez said he holds himself accountable for his actions. He believes that his actions influence the way others behave, therefore Gonzalez tries to be a “role model” for others to follow. “I think I should work my best to become a role model for everyone else who you know want to do the same thing that I do and that they also learn maybe some of my work ethic which would include just trying my very hardest,” Gonzalez said. Gonzalez’s busy schedule is filled with off-campus activities too. He is part of many volunteering organizations that help others such as the homeless. 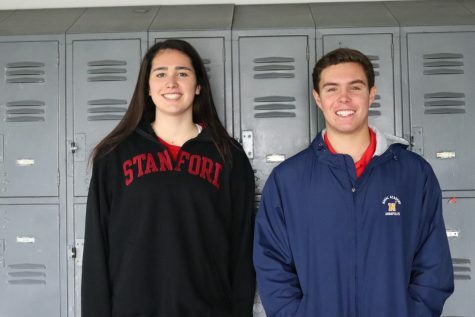 When choosing a high school, Mater Dei was the “best option,” Gonzalez said. Not to mention, he said, he lives around the block, and several of his relatives are alumni. For the rest of his senior year, Gonzalez plans to continue earning good grades, and “also help as many people” as he can, he said. “My ultimate goal is to be remembered as a leader and also be remembered for being a very happy and very helpful person,” Gonzalez said. Morales exemplifies leadership through her devotion to participating in several aspects of campus life. 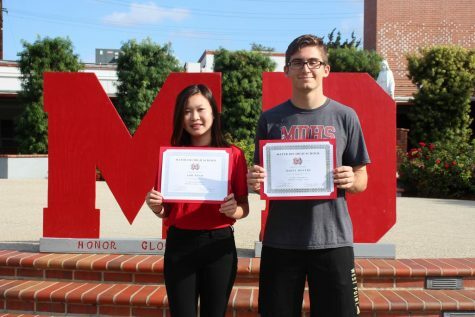 Morales is one of the head commissioners of the Scarlet Ambassadors, a girls’ varsity soccer player, and the president of the Star Wars Club, a organization she started in the fall of 2017. Now the school’s second largest club, the Star Wars Club raises money for the Children’s Hospital of Orange County and enjoys watching the Star Wars films together. Taylor Morales was selected as one of January’s Monarchs of the Month. 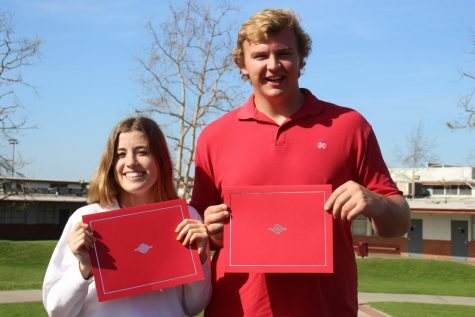 “I think Mater Dei [is] a super unique experience where you can really make the most of it and have so many opportunities to be able to pursue so many different interests that I have, so I really wanted to spend my four years taking advantage of that and being able to create my own unique Mater Dei high school experience, so I would look back and be happy with,” Morales said. Outside of school, Morales is the president of her National Charity League (NCL) in Irvine, a mother-daughter philanthropic organization. NCL is a program committed to community service, leadership development and cultural experiences. “I love volunteering, especially working with the elderly and my community, and the youth,” Morales said. Friday night football games are Morales’ favorite memory from her MD experience, she said. A standout moment from this year, she said, was when she was interviewed by Fox Sports for her inflatable shark at one of the biggest games of the year. In order to unite the student section, Morales originally brought the inflatable shark to the first game against Bishop Amat because the game was Hawaiian-themed. She dubbed it the “Sack Shark,” and whenever a major play occurred, Morales said she “would scale the railing of the student section” with the shark. 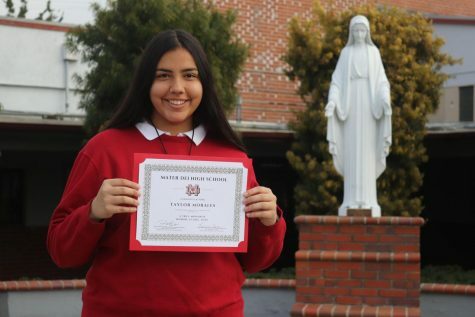 Morales originally made the choice to attend Mater Dei because of all the opportunities the school has to offer. 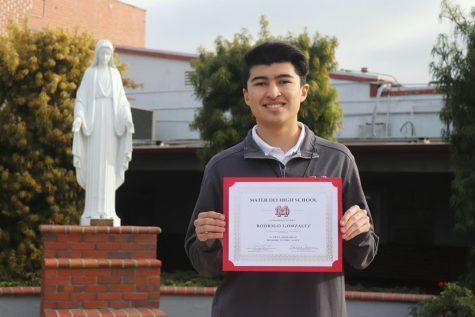 “I chose to attend Mater Dei because I just thought that instead of having to pick if I wanted to be a soccer player or a student on ASB, they gave me the opportunity to do everything that I wanted to do, and if they didn’t have something then I can make it,” Morales said. Before she graduates, Morales said hopes to continue making new people smile. “[I also hope to] make the most of it, make a ton of friends, [and] be able to know all my classmates by the time I graduate,” Morales said.